The doctors at our wellness center believe that additional therapies are an essential part of your overall well-being, as well as a complement to our other chiropractic services. Therapy can aid in healing, relieve pain, plus increase strength and stabilization. Based on your medical necessity, your doctor and the qualified therapists at our practice will determine a course of treatment tailored to your specific condition or injury. Then, during your therapy, our therapist will work on your muscles, ligaments, tendons, joints, fascia and other areas that are pertinent to the kind of therapy you are receiving. Manual Therapy can help you recover faster and perform better. Active Isolated Stretching – a technique of muscle lengthening and fascial release. A type of athletic stretching that provides functional and physiological restoration of both superficial and deep muscles. Cold Laser Therapy (LLLT) – a tool used to reduce pain and inflammation. It regenerates tissues at a cellular level while also helping to speed up the tissue’s ability to heal itself. E-Stim – a tool used to provide relief by utilizing electrical impulses to prevent pain signals from reaching the brain. Rapid Release – a tool used to help loosen up muscles that are tight or in spasm. Soft Tissue Mobilization – a technique used to break up inelastic or fibrous muscle tissue such as scar tissue, move tissue fluids and relax muscle tension. Thermotherapy – a technique that involves applying heat to a localized or general area of the body using hot stones or bamboo. The result is a relaxing treatment that soothes even the deepest of muscle bringing comfort and relaxation. Trigger Point Therapy – a technique of relieving stored stress in specific spots in the body known as trigger points (knots), which can cause pain. By holding pressure on these areas the tightness and pain can be relieved. Ultrasound– a tool used to warm tissue, increase blood flow and reduce pain in specific muscles. Whole Body Vibration – Whole body vibration increases strength, dexterity and endurance. This physical rehabilitation technique works and challenges your muscles in small, rapid vertical and horizontal motions. This motion excites stretch receptors and tendon reflexes in joints, promoting increased receptor activity and safely challenges balance and coordination. Kinesiology Taping – Kinesiology taping provides support without restricting the range of motion, helping to prevent overstretching and over-contraction of affected muscles. This form of treatment helps to relieve acute and chronic pain, reduces swelling and inflammation and improves circulation to injured areas helping you to heal faster. It can even enhance the strength of injured or under-toned muscles to prevent further injury. 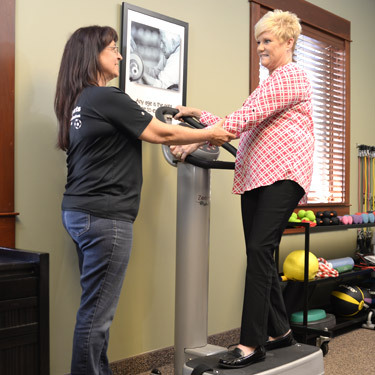 One-on-One Training – You’ll enjoy individualized attention at our wellness center facility. You’ll perform specific exercises under the therapist’s supervision in a room equipped for rehabilitation. Some of these exercises can also be done at home. We realize that here in Holland you have a choice of many therapies, but at Parkhurst Chiropractic, we believe that the mind, the body and health must all work in tandem to achieve overall balance, and that is our ultimate goal. Therapies are just one step on the path to helping the body attain that balance. Our effective therapies can help you get out of pain and back to your life. Contact us today to find out more, or to make an appointment!